... about being a casualty. Listening to these songs in the parking lot this afternoon made me feel a bit antisocial and embarrassed. I was sitting in the car with the windows down, and every time someone would walk by, I either turned the volume down to a mere whisper or ejected the tape altogether. These songs are a bit in-your-face after 7½ years of substanceless rhetoric under Bush's regime. PETA and ALF were, aside from the National Geographic Society, the first organizations I joined. 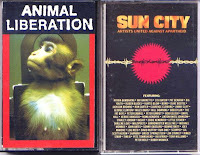 I purchased the Animal Liberation cassette directly from one of those organizations. It seems that I bought the Sun City tape from some big store bargain bin. I've often wondered just how much of my money went to support those causes, especially after the markdown. 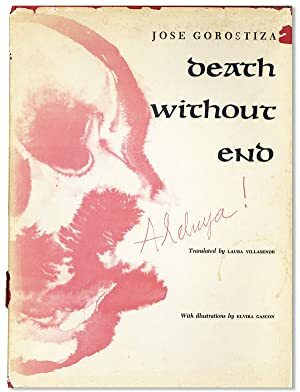 Animal Liberation begins with "Animals are not ours to eat, wear, or experiment on" translated into several languages over ominous music. Ministry's Al Jourgensen was a master at producing the segments between the songs. For the most part, they are the only elements of this tape that still hold up twenty-one years later. Regardless, this tape was not only a token of my then political involvement but also served as an entry point to music completely different from what I had been listening to before. Nina Hagen, Lene Lovich, Luc Van Acker, Shriekback. At that point in my musical experience, the only artist I had heard of prior was Howard Jones. I still think Chris & Cosey's "Silent Cry" is hauntingly sublime; the other tracks are almost unlistenable these days. My funniest memory concerning this tape: teaching my then toddler nephews and niece the chorus to "Don't Kill the Animals." One morning I worked them up into a frenzy after several minutes of rehearsal and turned them loose on my mother. They surrounded her, chanting the never-so-subtle "Don't kill the animals. Don't kill the animals. The animals are free!" followed by the screeching and ascending "Hee hee hee hee!" I have tremendous respect for animals rights activists. Not celebrities who put their face in ads or wear tee shirts, but the real activists who burn down laboratories after rescuing animals. But there will be no more midnight, flashlight-wielding break-ins for me. It's the rhythm of the beat! http://www.amazon.com/Animal-Liberation-Nina-Hagen/dp/B000008CWR .the same compilation? .your cassette seems to have many more credits and is credited to sun records and not waxtrax. The Amazon item seems to be a CD version released by Wax Trax; all the tracks appear to be the same as the cassette I have. I can't believe those pricks are asking $22-$148.80 for this! (And I'm certain none of the profit is going to support animal rights.) Part of my long-term plan is to digitize my cassette collection, but I'm nowhere near beginning this process. Whenever I do begin, I'll contact you to let you know where you can access my private stash. Thanks for contacting me.